This USB to RCA S-video audio capture device turns your PC into a full-featured video player and digital MPEG video recorder. This package provides an easy and cost-efficient hardware/software solution for PC users to watch, capture or record live video from DVD player, cable box, satellite receiver, CCTV cam, game console and so on and save recorded video footage into PC hard drive for further video production. 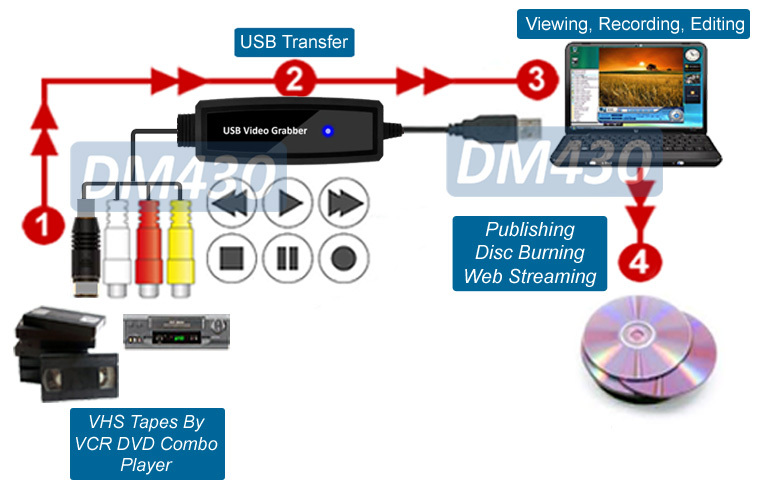 This video frame grabber hardware/software bundle empowers PC users with composite video/ audio inputs so they can easily create high impact multimedia content for great visual aide, business presentation, educational training or streaming on the internet from the captured video clips or images. 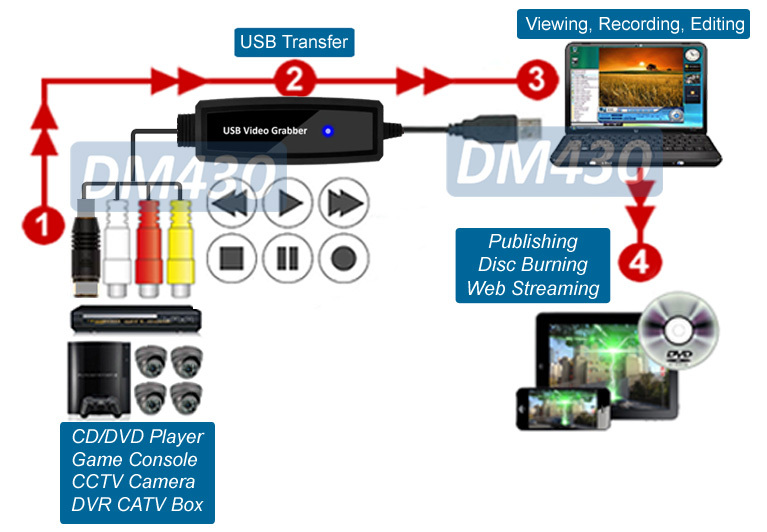 This video to USB DVR adapter supports comprehensive digital MPEG and DVD formats. Input video and audio feeds are captured in real-time. It also supports still picture capturing in BMP, GIF, PNG and JPG formats via the software snapshot button. The featured Picture-On-Picture function allow users to have the video window and the web browser stay on the computer screen at the same time. The video window screen size and location can be adjusted as needed with ease. Simply plug and play with absolutely no driver installation needed for all Windows OS. The easiest model for PC users of all levels. It will become ready for use in 1 minute ! By installing this USB capture device to your PC, you can instantly expand your laptop or desktop PC with 1 of composite BNC RCA video input, 1 of S-Video input and 1 stereo L/R input for hookup with VCR/DVD player, cable box, satellite receiver, camcorder, CCTV camera or game console for real time viewing and recording with PC. 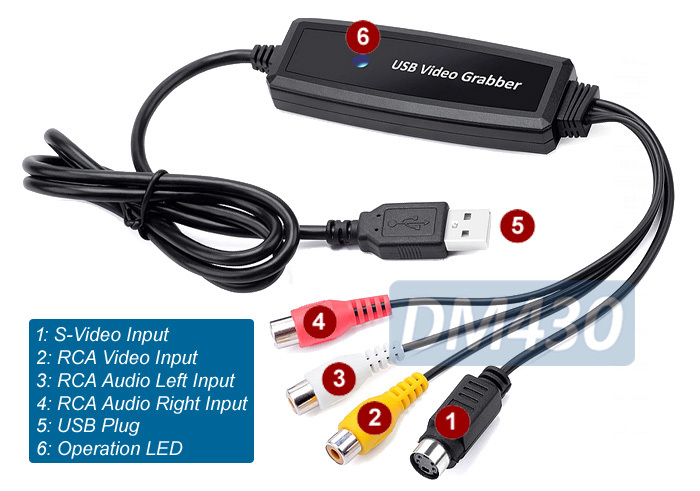 This USB video frame grabber package is bundled with full-featured DVR software for recording video audio feeds and saving the recorded content into the hard drive for playback or further video production. Various video formats are available for recording session. The supported video output formats from recording includes the popular MPEG1,MPEG2, MPEG4, VCD/CD and DVD formats in both NTSC and PAL output standard. Users have the option to choose between recording/encoding speed and the maximum DVD video recording resolution can be up to 720x480 pixels at 30 fps. This DVR software also supports both 16:9 wide-screen and 4:3 standard ratio selection for display on computer screen. Users can connect any type of video camera such as CCTV surveillance camera, wireless camera, microscope camera or camcorder to this USB adapter installed in the PC so they can view camera feeds on the computer monitor screen in real time with no lags. This USB DVR device also supports picture-on-picture function so the video window can always stay on top of all other software application windows so users can remain using the computer for other tasks while viewing the video feed from your cable box, satellite receiver, game console or CCTV surveillance camera at the time. The PIP video window location and size can also be relocated and re-sized as needed or stay full screen for display. This DVR software also supports still image capturing to take a snapshot at any favorite video theme. The image files can be in JPG, PNG, GIF or BMP format. This USB A/V adapter helps archive all the legacy VHS tapes and other analog video contents in digital file formats for permanent collection, storage, DVD disc production or further editing via 3rd party video software before your tapes get worn out and no longer viewable. User can also upload the saved video feed to YouTube or other web video server for broadcasting on the internet. This unit automatically detects NTSC, PAL and SECAM, video formats for worldwide compatibility. This USB 2.0 video capture device adopted the advanced analog to digital conversion so the captured video is error free with optimal color and clarity. Complete USB video capture hardware/software bundle to expand laptop/desktop PC with 1 composite RCA video input, 1 of S-Video input and 1 stereo L/R input. Cost-efficient USB-based video frame grabber solution for turning computer into a full-featured digital video recorder. Smooth video/audio transfer from DVD/VCR player, cable box, satellite box, game console, etc. into PC through USB connection. Plug and play setup. No driver installation needed for users of all levels. Advanced video digitizer for error free analog to digital MPEG conversion with optimal color and clarity. Save recorded files into hard drive for playback or further disc production. View live CCTV surveillance camera, wireless camera, microscope camera or camcorder on PC screen. Great tool for using computer for multimedia tasks such as creating digital content for high impact visual aide, presentation, education or streaming on the web. Supports both 16:9 wide-screen and 4:3 ratio for video window size. Supports Picture-In-Picture mode so both video window and software screens can be displayed together while users can remain using computer for other tasks. The PIP video window location and size can be relocated and re-sized as needed or stay full screen for display. Supports comprehensive video formats including MPEG1,MPEG2, MPEG4, VCD/CD and DVD formats in both NTSC and PAL output standard. Supports snapshot function to capture still picture of video theme in BMP, GIF, PNG and JPG formats via software snapshot button. No driver installed needed for all PCs running with Windows 10, 8.1/8, Win7, Vista, XP. Supports worldwide video and audio inputs in NTSC, PAL and SECAM standard. Operation System Support: Win10, Win8.1/8, Win7, Vista, XP.